BitRaser for Mobile is a privacy safeguarding software that securely erases all data from iPad, iPhone, and Android devices. The software erases up to 40 iOS or Android mobile devices simultaneously based on 9 international data erasure standards. The software ensures complete data privacy and security when mobile phones are disposed, exchanged, or recycled. Supports 9 International data erasure standards— US DOD 5220.22-M (3 passes/7 passes), HMG etc. When you dispose off or exchange an Android or iOS device such as iPhone or iPad without wiping, the data stored on the mobile device might get exposed to unauthorized access. Resetting Android or iOS devices doesn’t remove data permanently from the internal storage. Thus, your private and sensitive data such as photos, videos, emails, contacts, messages, and more can be easily recovered by any data recovery expert or service provider. 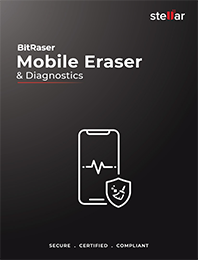 BitRaser for mobile permanently erases data from various Android smartphones and iOS devices beyond recovery and generates a certificate of erasure to meet data protection laws and regulatory compliances. BitRaser for Mobile is a DIY data erasure software that quickly erases a variety of information stored in the internal memory of your mobile devices. The software enables you to quickly wipe your sensitive files from smartphone beyond the scope of recovery. So before you handover or exchange your old mobile device, wipe internal storage with BitRaser for Mobile to ensure data privacy. Even after factory resetting the Android or iOS device, residual data remains on the internal storage of the device that poses great risk of identity theft. Besides, the buyer or the recycler can also recover information like credit card details, bank account information including passwords, emails, documents, photos, videos, and more. BitRaser for Mobile completely sanitizes your mobile devices for secure disposition. It helps mobile and electronics refurbishing businesses to stay compliant with data security & privacy regulations such as SOX, GLB, HIPAA, ISO27001, EU-GDPR, and PCI-DSS. RBitRaser for Mobile is a pay-per-use software with no expiry of the license. The license remains valid for a single mobile device or several Android or iOS devices at once—so you can spend exactly as per the need. It’s tightly integrated with the cloud for license distribution and user management. The cloud repository also stores the reports and certificates of erasure. BitRaser for Mobile can securely destroy data from up to 40 Android and iOS devices simultaneously. This saves significant time and resources, which make BitRaser for Mobile a cost-effective solution for ITADs and recyclers. The software also generates tamper-proof certificate of erasure to meet regulatory compliance with global standards for data privacy and security. BitRaser for Mobile is an environment friendly data erasure software for mobile devices that leaves no e-waste. Many regulatory standards require ITADs to destroy information in an eco-friendly manner. BitRaser for Mobile is a certified software-based data destruction tool with zero emission and no e-waste generation. A mobile device wiped with BitRaser for Mobile can be efficiently reused and recycled, which helps conserve the environment. Q1. What is BitRaser for Mobile? What are its key features? BitRaser for Mobile is a data erasure software for Android and iOS devices to safeguard user data and prevent it from falling into wrong hands. Data erased with BitRaser for Mobile cannot be recovered. Q2. Can we reuse or sell the mobile device after erasure? Yes, devices can be reused or sold after data erasure, as erasure process does not harm the devices in any way. Q3. How can we verify that residual data is not available in mobile devices after performing data erasure? Data recovery software can help you verify that there is no residual data available on the mobile devices. For example, use Stellar Data Recovery for iPhone to scan iPhones that have been erased with BitRaser for Mobile, and ascertain the efficacy of the erasure tool. Q4. Can I share BitRaser for Mobile report and certificate while selling the mobile phones? Yes, you can share the report and certificate as a proof for non-recoverable residual data. BitRaser for Mobile allows to save and share reports in three different formats – HTML, XML and PDF. Q5. Can we edit the existing fields of the erasure report? Yes, it is possible to edit the existing fields in the erasure report, but only before the final copy is produced. Once the report is shared with the user, it is considered as final and cannot be tampered. BitRaser for File (Mac) is a powerful Mac file eraser software to wipe selected files, folders or d..